A common concern for those who are in the process of getting hearing aids is how they will work with a smartphone. Over two billion people worldwide use a smart phone and that number is rapidly increasing. Many smart phone users have discontinued the use of their landline phones, preferring to rely exclusively on their smart phones. Due to the overwhelming smart phone expansion, the question of how hearing aids will interact with smart phones is more relevant now than ever before. Fortunately, the major hearing aid manufacturers have stepped up to include smart phone compatible hearing aids as part of their product portfolios. Although compatibility with Bluetooth-enabled mobile phones, or even smart phones, has been available since 2008, this compatibility was only available through an additional accessory. The hearing aid user had to wear an accessory, usually around his/her neck, which acted as an intermediary between the mobile phone and the hearing aids. Many hearing aids users opted not to use this technology because they did not want the inconvenience or conspicuous nature of having a device worn around the neck. 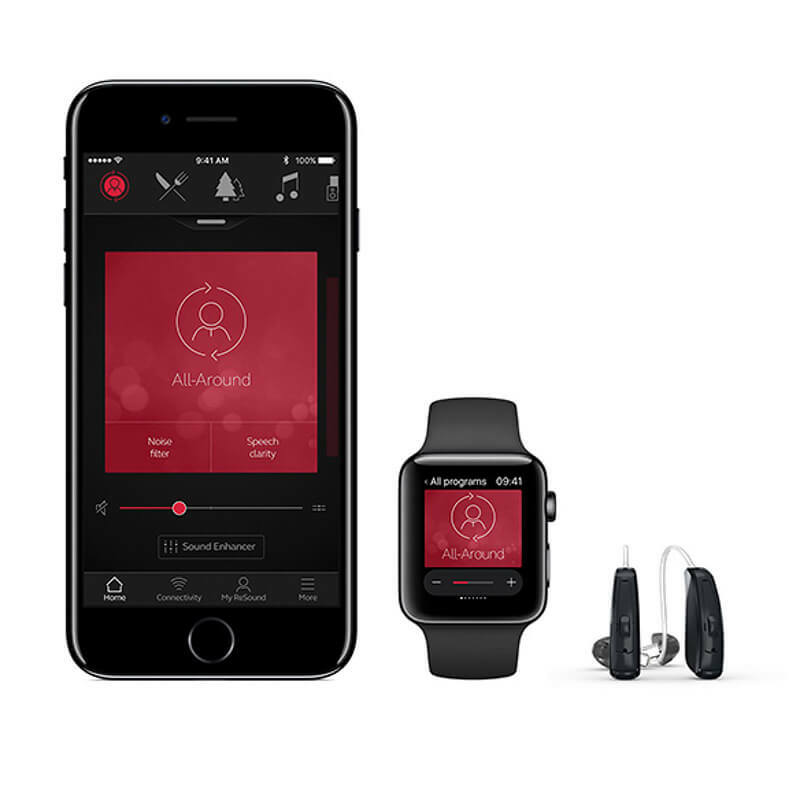 In 2014, both GN ReSound and Starkey introduced Made for iPhone hearing aids. This was a major game changer in that this technology allowed the hearing aids to connect directly to the iPhone without the need of an accessory device. Hearing aid users could hear phone conversations into both hearing aids rather than having to hold the phone up to one ear and rely on transmission from the phone receiver into the hearing aid microphone. This also has allowed hearing aid users the ability to stream music and other audio directly into their hearing aids. In subsequent years, almost of the major hearing aid manufactures have included this feature as well. The major downside of Made for iPhone technology is that it did not allow the hearing aid user to be completely hands-free. The hearing aid user was still required to speak into mobile device’s microphone so the party on the other line could hear the conversation. Another major disadvantage was that users with Android or other types of mobile phones could not benefit from this technology. 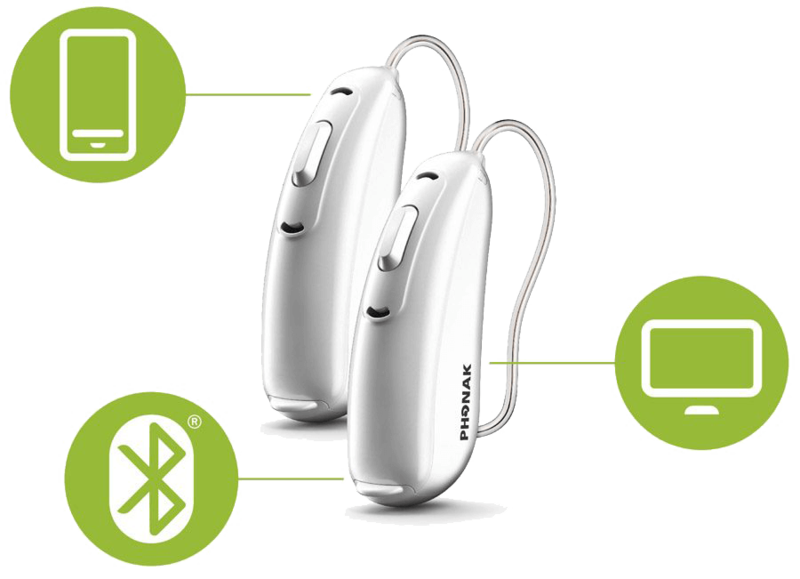 In 2017, Phonak introduced a product which allowed the user to be completely hands-free and was compatibility with all Bluetooth enabled phones. The Phonak devices used the microphone of the hearing aid itself, rather than the phone’s microphone, to pick up the user’s voice. This was another major game changer allowing complete hands-free capability and expanding use to all Bluetooth enabled cellphones. The major disadvantage of the Phonak product is that it only streams the conversation to one hearing aid. The hearing aid user has to choose during the hearing aid fitting whether he/she wants to stream to the right or left ear. This device also does not allow for the streaming of music or other audio. Starting in 1988, the Hearing Aid Compatibility Act required that telephones be designed to work with hearing aids, and this mandate was expanded in 2003 to include wireless phones. 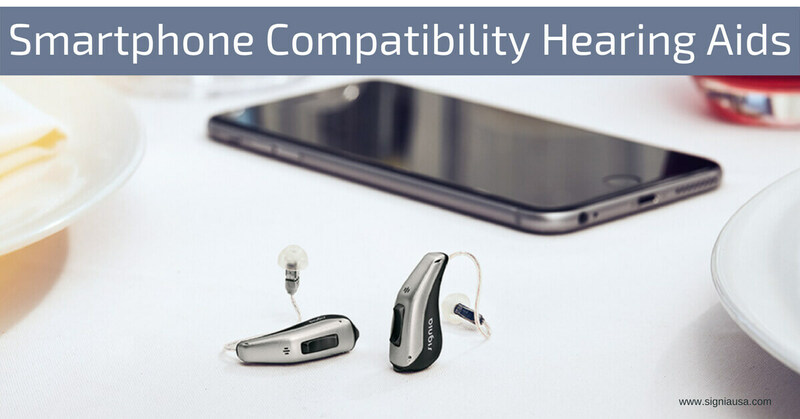 These types of coupling (pairing) between the hearing aids and the phone are discussed below. Hearing aids should all be compatible with recent telephones through acoustic coupling. This allows the receiver of your telephone to be used with a hearing aid without an additional interface. Simply putting your ear up to the phone should allow it to be used while you are also able to hear the surrounding sound of the room in which you are talking. You may have to adjust the way you hold the phone, so that the phone receiver is within close proximity to the hearing aid microphones. Beyond acoustic coupling, telecoil technology made it possible to pick up the electromagnetic energy from your phone for those with more severe hearing loss. Some aids require you to manually switch on the telecoil functionality, while others are able to automatically detect the need for telecoil coupling with a phone. Beyond these smartphone compatible hearing aids, other add-on devices can be useful for your existing aids, even those that were designed before the wide adoption of smartphones. These devices are used to put distance between hearing aids and smartphones in order to reduce interference and noise between them, including a time lag in conversations. Hands free devices are a good starting point, just like those that are designed for use during driving. Neckloops and earhooks can be useful for creating this distance, as well. Finally, an additional earbud feature can be used with many hearing aids. This earbud connects the amplifier and microphone of the hearing aid directly to the smartphone, including Bluetooth compatibility. With the wide array of smartphone compatible hearing aids, you should have no problem carrying on conversations clearly while also being able to hear the sounds in your surrounding environment. Beyond the basic use of the phone, Bluetooth features add notifications, ringers, and volume control to suit your particular needs. Talk to us at Elite Hearing Center for further information on the particular hearing aids that can suit your smartphone-compatible needs.